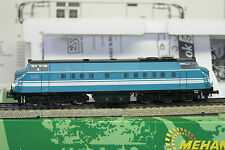 MEHANO 7764 Antwerpen SNCB NMBS AC ANALOGIQUE pour MARKLIN 3 RAILS PROMO !!!! He had installed a KD coupler on the tender. It has electrical pick-up on the tender wheels. EXCELLLENT CONDITION - Minor scuff on cab roof. IHC's universal Magic Mate coupler body-mounted on tender. 4-6-4 Hudson, MILWAUKEE. Nickel silver handrails and coupler lift bars. Negotiates 18 " radius curves. Precision gear transmission. Brass flywheel. VINTAGE MEHANO H0 4828 GG-1 PENNSYLVANIA LOCOMOTIVE. NEW. IN ORIGINAL BOX. IN ORIGINAL BOX. Runs Perfectly. Made In Slovenia. Boston and Maine 2-6-0 steam engine dc powered by Mehano. No box but will be well packed for safe arrival. Photos are part of the description. This runs very well super smooth and quiet. 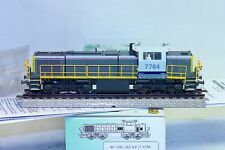 HO Scale EMD GP-18. DIESEL LOCOMOTIVE. I do not know what they have been exposed to or where they have been. An oversight or lack of knowledge on my part is not an attempt to deceive or mislead. With nice detailing, Kadee couplers, this engine would make a great addition to your layout! Box is in good condition with very minor wear. "The George Washington". Original Box. If it was ever played with it was very taking care of. MOGUL #M 596. HO Scale LOCOMOTIVE 2-6-0. GREAT NORTHERN R.R. READY TO RUN. 1 CRANE CAR W/BOOM TENDER. SET INCLUDES. Condition:Factory Fresh Fantastic Life-Like Model! Testrun Only! Complete with the original box and the full contents! This modle is DC 2-rail operated. This part needs to be replaced by one which is suitable fro your own country. Condition:The set is like new! Wonderful High Speed train from the Spain National Railways! Very Collectible Condition! No discoloration, it needs a good cleaning. Minor playwear. Slight wear here and there. 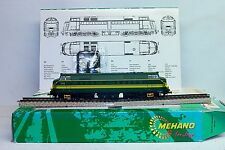 Mehano HO 1:87 USA BOSTON & MAINE DIESEL LOCOMOTIVE + GOODS VAN WAGON Set Mint! Condition:100% Top Mint Condition! This is an ultra rare, original 6-Piece USA Boston & Maine Locomotive and Goods Van Wagon set. These Goods Vans where based on the original ones and are great lookerlikes. Mehano HO 1:87 French SNCF HIGH SPEED TGV "POS" 4-Piece MULTIPLE UNIT MIB RARE! Super well made and wonderful detailing! (Original Factory Produced.). TGV "POS" Modern, Colorfull 1st & 2nd Classes, Art Painted, Super High Speed Intercity Bullet Train. -Scale:1:87 (HO Model train Lay-Out scale.). Fleischmann, Rivirossi, Mehano TGV. Train Sets. Code 100 Two Rail Track. DB passenger 1980's," Orient Express" from 1976 movie. Latest THALYS Version with Modern Series 2 Logo! -Condition:100% Top Mint Condition! The train was hardly used if ever!, handled with great care. No wear at all as for the contents! I strongly doubt about if it was used. Scale:1:87 (HO Model train Lay-Out scale.). (High Speed, INTERNATIONAL MAIN CITY TRAFFIC High Speed Train Set, Electric Multiple Unit.). Enjoy the benefits of DIVANDO! Complete with Motorized Unit! GG-1 Electric #4800 BLUE. Compatible with ALL popular HO models. This sleek engine served as passenger and freight motive power on the Pennsy and its heirs for nearly 50 years. GG-1s began working electrified mainlines in 1934. Plastic is in pretty good shape one spot on corner another spot on side and a tear where the engine is. Super well made and wonderful detailing! (Original Factory Produced.). TGV "ATLANTIQUE" Modern, Blue/Silvergrey, High Speed Intercity Train. -Condition: 100% Top Mint Boxed Condition! Fantastic Life-Like Model! Mehano. Railway. MEHANO. TGV POS with landscape. 1/87. Condition:Near Factory Fresh Fantastic Life-Like Model! Testrun Only! Complete with the original box and the full contents! This modle is DC 2-rail operated. This part needs to be replaced by one which is suitable fro your own country. HO AND N SCALE. We will be happy to answer and help you the best we can. Engine runs good in both directions, headlight works. See photos for more details. Pillsbury reefer box car. Green giant reefer box car. Burlington gondola car. Mehano Master Model Makers Wilson & Co. yellow HO box car made in Yugoslavia in the original box. The box car appears never to have been used, the box has an exterior stain from storage. MOGUL #M 560. 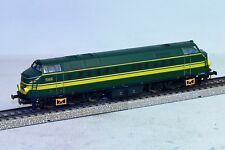 HO Scale LOCOMOTIVE 2-6-0. PENNSYLVANIA LINES. READY TO RUN. (VAGONS IS DRIVING SAFETY :). LOCOMOTIVE IS WORK GREAT.